"Srila Prabhupada," Tamala said, "when you get to London the devotees will be so pleased to be with you." "Yes," Srila Prabhupada replied, "it is good that we are going." Otherwise, Srila Prabhupada was mostly silent, meditating on Krishna and his mission of bringing love of Krishna to the world. The flight turned out to be an unusually exhaustive ordeal. When the plane landed in Rome it was delayed there for four hours, and Srila Prabhupada had to wait in the airport lounge. When finally they arrived over London, the captain announced that they could not land yet due to the strike, and so they continued circling for hours. Finally, twenty hours after leaving Delhi, the plane landed at Heathrow Airport. At Bhaktivedanta Manor, Srila Prabhupada went from the car to a palanquin and entered the temple room, where about three hundred disciples and well-wishers were waiting to be with him. Devotees from all the ISKCON centers in northern and southern Europe had rushed to England on a last-minute notice. They had been praying for him for months. The prayer, "My dear Lord Krishna, if You desire, please cure Srila Prabhupada," had been printed on a banner and hung over Prabhupada's vyasasana. The Deity room curtains were open, and Srila Prabhupada beheld Radha-Gokulananda. Some devotees stood in front of him, and with a small gesture characteristic of his hand, he waved them aside. Without any change of expression, he sat with concentrated attention facing the gorgeously dressed Deities of Radha-Gokulananda, whom he had named four years ago when calling for Them to come and be worshiped here by the devotees of England. Srila Prabhupada looked forward to traveling to America shortly after Janmashtami, which would fall on September 6, two weeks from the date of his arrival in England. "I want to live a little longer," he said, "to make everything more perfect." "Will you do this by enthusing the devotees by staying with them," asked Tamala Krishna, "or is there a specific program?" "A specific program," said Srila Prabhupada. "I want to introduce varnashrama. At our Pennsylvania farm, the biggest problem of life is solved: food." On Janmashtami day Srila Prabhupada rode in a rented Rolls Royce to the temple at Bury Place in downtown London to see Their Lordships Sri Sri Radha-London-isvara. Entering the building in a palanquin, Prabhupada came before Radha-London-isvara and slowly removed his sunglasses, his eyes flooding with tears, while around him devotees chanted his name and the names of Radha and Krishna. The next day was Vyasa-puja, Srila Prabhupada's eighty-second birthday. 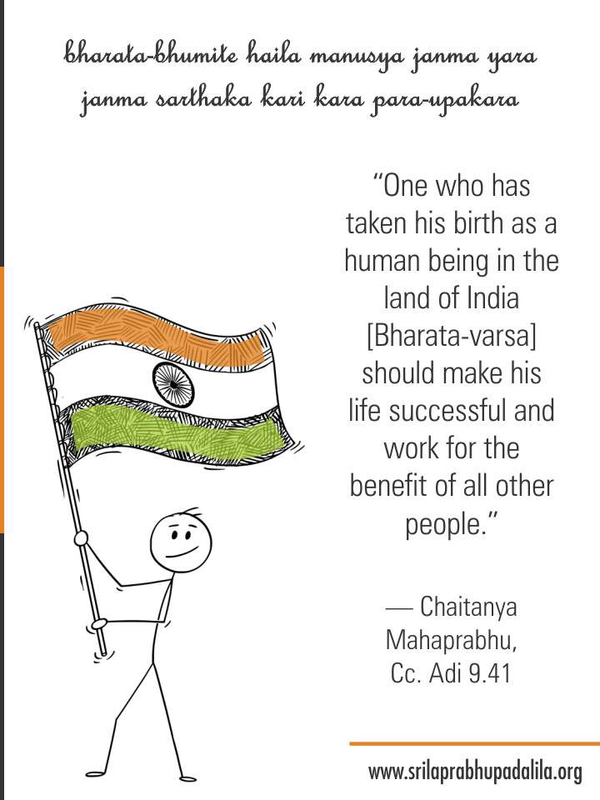 Again, upon waking he recalled his childhood and how an uncle had called him Nandulal, because he was born on the day Nanda Maharaja gave presents to the brahmanas, the day after Krishna's birthday. 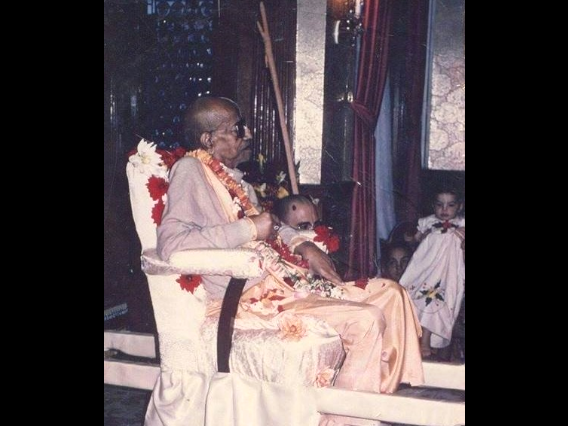 Srila Prabhupada went down to the temple, and after a fully exultant kirtana by hundreds of devotees, he accepted, without tasting, a three-tier, five-foot-long birthday cake. He noticed that the devotees had only used eighty-one candles, due to counting age by the Western method, so another candle was added. At Srila Prabhupada's request, Tamala Krishna stood and spoke. 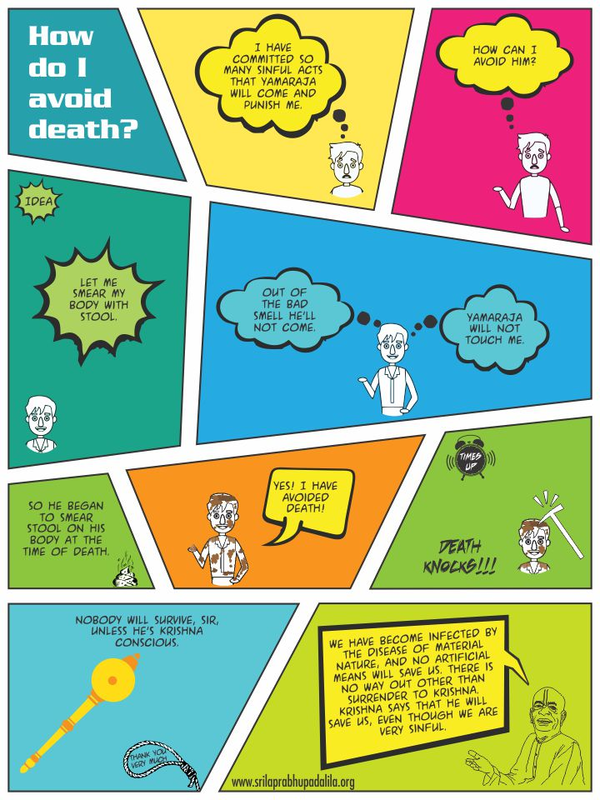 Prabhupada How do I Avoid Death?